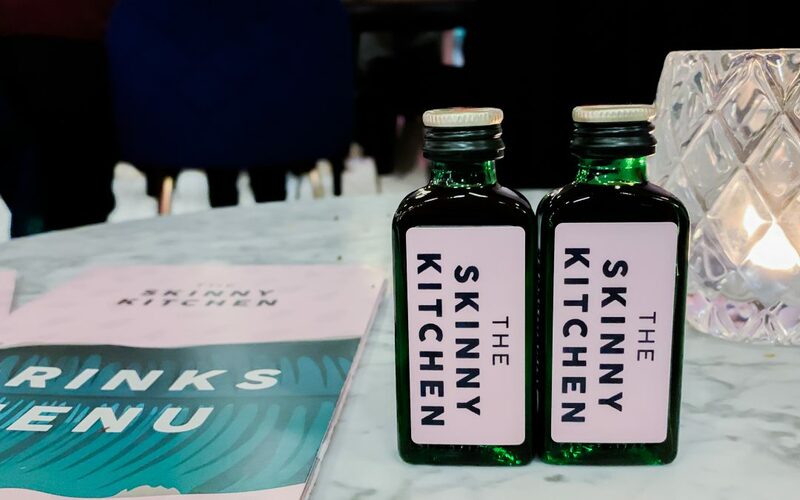 After success in Ibiza ‘The Skinny Kitchen’ launched its restaurant in Angel, London. The Skinny Kitchen is loved by the healthy eater as the restaurant is known for its lower calories and vegan menu. You enjoy all the food you love without any guilt and the launch night was amazing. I was offered a glass of prosseco as I was escorted to my table when I entered. Amazing service and with a smile something I love to see in a restaurant. Each waiter wore all black t-shirts with The Skinny Kitchen slogan across the back. An elegant outfit which suited them, people do say black makes you look thinner. The waiters served us mini deserts and I started to eat pancakes with peanut butter cream and berry compote. A very blue mouth later, I was finished and wished for another one, it was delicious. I was shocked at how much I liked it because peanut butter is not usually to my taste. For those with a savoury tooth the quacomole on tortilla circles topped with bacon were delicious. The crunch of the bacon complimented the smoothness of the avocado. The mini vegetarian burger was apparently delicious but in my hurriedness to try other food I lost mine to my friend. 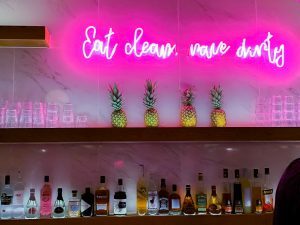 The decor of the place was fabulous with quirky phrases in neon ‘I licked it so its mine’ and ‘Eat clean move dirty’. Instagram must have been flooded with these the next day, they were my favourite. The open bar and kitchen gave you a chance to get up close and personal to your order which I loved. I could see the lovely chefs and bartenders who were preparing my food. the 60’s diner theme was chic, with checkered floors, artificial plants and velvet seats. The DJ booth set up in the corner, fitting perfectly, creating plenty of space for the dance floor, filled with smiling and grooving people. I left with a goody bag and a guilt free full belly. What a way to end a good night! Skinny Kitchen’s Christmas Menu is from December to January 2019 with a two course meal for £18.50 and a three course for £24.50 which is worth it.